When I meet Syrian musician Mohanad Aljaramani in a café in Paris, it is difficult to know how to place him. Shy at first, and unsure whether to speak to me in French or Arabic, he lights up immediately when he begins describing his life-long love affair with Arabic music, taught to him by his father, a musician who gave him his very first oud when he was a boy. He doesn’t even remember learning the oud, only playing it naturally like one learns to walk, as something that was always part of his life. His two older brothers are also both professional musicians: one plays the oud and the other the ney. They grew up in Syria playing together. I ask him why he never had any women in his musical groups. He laughs. “I don’t have a sister,” he says. 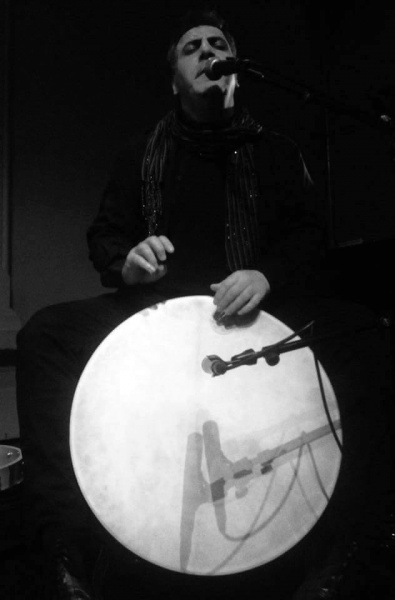 Today Mohanad sings and plays the percussion and oud in Bab Assalam, a band based in France and composed of him and his older brother Khaled as well as French musicians Raphaël Vuillard, Philippe Barbier and Emmanuel Saulduboi, who add an unlikely fusion of electric guitar and clarinet. Mohanad was born in 1979 in Sweida, a region in Southern Syria at a crossing point between Syria, Lebanon, Jordan, and Palestine, with a volcanic landscape and a complex musical history containing influences from overlapping cultures. His father was a Communist, and yet the region was known for its Sufi influence, creating an atmosphere both traditional and radically open to new sounds. Mohanad grew up listening to Lebanese, Syrian, Palestinian and Bedouin music, as well as the political songs of Lebanese musicians Ziad Rahbani and Marcel Khalife, and the oud music of Iraqi Munir Bashir and Tunisian Anouar Brahem. But music was also part of the fabric of everyday life, played and sung by his neighbors at weddings, during celebrations, during voyages. 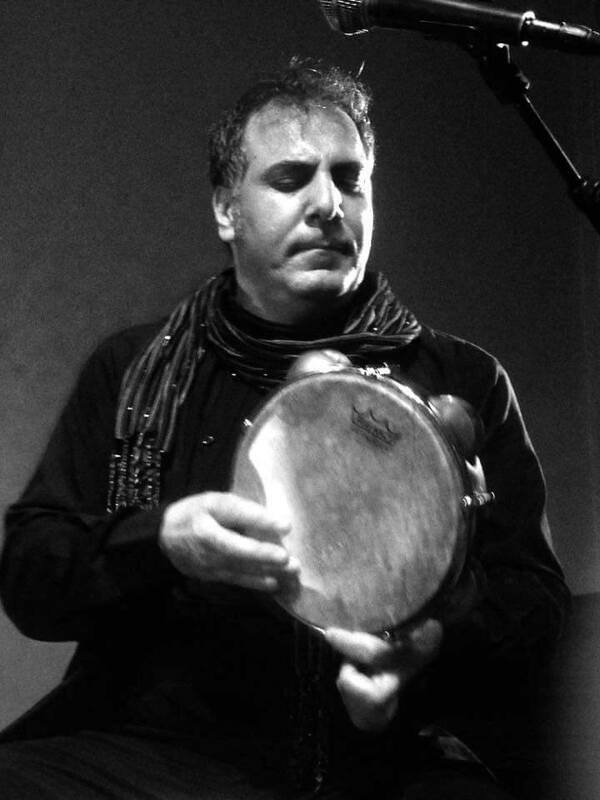 Since then, Bab Assalaam has continued producing music closely tied to Syria, with an album named after Ziryab and another named simply Exile. At the same time, the French musicians add electric guitar and clarinet, melding elements of jazz and electronic music. “We’re trying to search for a new sound,” Mohanad says. Their next project—their most ambitious yet—is to introduce the tradition of Arabic musical theatre to Europe, with music accompanied by cinema, drama and puppetry. He credits the inspiration with two other famous musicians of the past with deep roots in Syria: Abu Khalil al-Qabbani and Sayed Darwish. Known as the “Father of Syrian Theatre,” Abu Khalil al-Qabbani was born in 1835 in Syria, where his theatrical performances caused such a stir that they were banned, causing him to flee to Egypt. There, in exile, he encountered a more vibrant, open society, where he pioneered the concept of musical theatre, a genre that would have lasting effects on Arabic music and literature. His brother was the grandfather of Syria’s most famous modern poet, Nizar al-Qabbani. Sayed Darwish, on the other hand, traveled in the other direction. Born in Alexandria in 1892, he was trained to be a religious cantor. Legend has it that one day he was singing while laying bricks, when he was overheard by the Syrian Attalah Brothers, who asked him to join their theatre troupe and travel in Syria. His stay in Syria was short, and eventually he returned to Egypt, where he became famous composing songs for the theatre that remain popular until today. Yet the memory of his stay in Syria remains alive, and it was part of Mohanad’s identity when he lived as a student in Damascus, walking among the same streets. Mohanad Aljaramani on percussion. Photo courtesy of Mohanad Aljaramani. For more on Mohanad Aljaramani and others keeping Syrian heritage alive, see this article in the New York Times: https://www.nytimes.com/2017/03/11/opinion/sunday/in-a-refugees-bags-memories-of-home.html.